Some of you may have gotten a sneak peak of this post. I accidentally uploaded the pictures and published before I added my pithy commentary. Stupid ipad! I tried to delete the post before anyone could see it, but I think it was leaked. She then launches into the usual quadruplet questions. Again, she launched into the barrage of quadruplet questions. Honestly, I know that people have no filter and yes I am a little girl with a big belly. I’m not totally offended by their rude questions and I have to laugh about them. I do miss my old body though…I feel like I was hijacked and may never find my old self again. 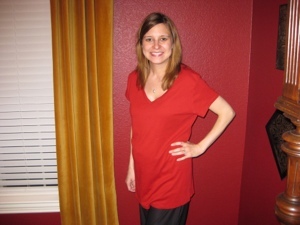 George and I decided it would be fun to take a picture of me in the outfit I wore the day before delivery. I seriously think I could be a Weight Watchers before and after picture. What do you think? Amber, I think you look fabulous and as long as you have your health that is what is most important. We think of you and your family often and can’t wait to see y’all and the babies. Take care…we love you! You got it, Debbie! Health is number one, mine and the babies. People are just weird. I think you look amazing!!!! Love the conversations. People just don’t know when to stop talking sometimes. Too funny and so true. Exactly, people just keep rambling sometimes. You look fab! And you’ll be back to your old self in no time! If it makes you feel any better, people said the same kinds of things to me and I just had one baby! You look amazing! Thanks, lins! It does make me feel better. What is crazy is that to of these commenters had children so know what it is like postpartum. I would not say a word to someone who looks like she is going to drop her baby on the floor any moment. Who knows, maybe she is a day postpartum! LOVE it!!! I need to steal that idea and take a picture of myself in my last-photo shirt, too! You look great! I can totally relate, and I always feel that had I not had quadruplets recently, I must look terrible based on very similar conversations with others too (which also leads into the FAQ’s of quads). I am fine with most comments.. but not really a lover to the back-handed compliments! Oh yes, becky snap a picture in the pre delivery outfit. It is great for the self esteem! Backhanded compliments are worse than insults sometimes! We think you have the makings for a best seller:” Conversations at Motherhood Maternity” — You look beautiful “before” and “after”….and during. Thank you so much for sharing your thoughts and experiences and give some serious thought to that book — We think it would be really helpful to many and a joy to read for everyone. That is a great idea! I enjoy writing all of this stuff down, before I forget! Amber, you look fantastic! I agree most people do not have filters, but I like how you bring humor to the situations. I love reading your blog and watching your sweet babies grow! I hope to meet them when they get to go home. Hi Jennifer, I just have to laugh at this stuff because it’s so silly. I’m sure when I go out with the fab four, the commentary will really ramp up! So funny! You look great! I barely see a belly in the after pic. Maybe you should attach a before pic to you…like a name badge??? The belly is a bit hidden in the huge shirt, but I think I look pretty good. Love the badge idea, too funny! Amber, I am amazed and awed at how fantastic you and the babies look. I am so tickled that all is going so well. Know the woods are stil there, but you seem to be able to be seeing a whole lot more daylight through the trees. 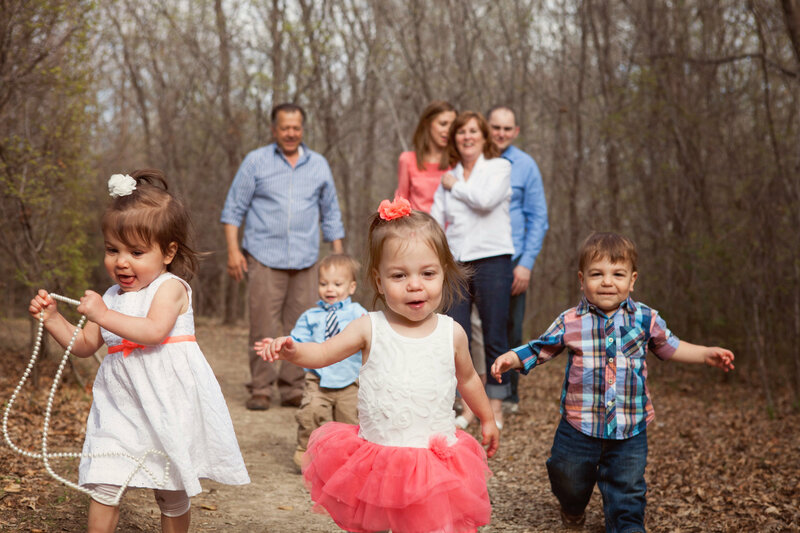 As for how you look…How about absolutely awesome for a new mommy of 4 new babies. My hat is off to you! Love ya and thanks so much for the updates. I have been excited to see and read all that you have put here. Take care! Wow! I can’t believe how great you look already! It truly takes a long time, but you’ll continue to change fast for a while, I’m sure. People always gave me the “you look great…for having twins” line, too. By the way, did you find a postpartum support belt? I’ve never heard of such a thing, but it makes sense. I wore my belly bands for quite a while after having the kiddos. I did get a postpartum belt, they had it right next to the maternity belts at motherhood maternity. That’s why I was so aggravated with the sales girl, it was right there. She just thought I was a confused prego! It helps tons to pull it all in since my ab muscle is spit! Tell me how that Pilates thing works. Maybe you can figure out how to do it in your sleep 🙂 I mean you can sleep standing up!